Before he gets out of training, I hope that he comes back one more time because I want to run against him. I need him to come back again." - Olympic marathon champion Sammy Wanjiru talking about Haile Gebrselassie's posssible retirement. Wanjiru was honored on Monday for being the World Marathon Major champion. Runners World Takes It To Ritz: "All the money in the world can't buy a faster marathon"
If Ritz doesn't run sub 2:07, is it bad coaching? 1983 New York Results (83 guys sub 2:22) What were they doing differently? Haile Gebrselassie: isn't retired, He Will Compete Again! So now the USA does not have one sub-2:10 Marathoner! Has Ryan Hall officially lost his mind? Britain's Mara Yamauchi Promises To Move On After "Shocker" Of Performance She was only 11th. Recommended Read: Geoge Hirsch Remembers Fred Lebow - The Man Who Helped Make The New York City Marathon Great Thankfully, Mary Wittenberg is now in charge to carry on his legacy and make it even greater, as the race fell off in the late 1990s. *Update On Justin Gimelstob - Andy Roddick $10,000 Bet For 4:45 Finish We find it embarrassing the the NY Times calls the Cornell grad helping Gimelstob a world record holder. 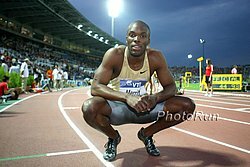 *Larry Rawson's Final Pre-Race Thoughts Rawson reveals that Haile G for the first time turned over all business dealings for the final two months to associates so he could focus on training. Brendan Foster Among Those Hoping For Haile U-Turn "I was sad really because there's always been Haile Gebrselassie, he's been winning world championships since 1993." Steve Cram Surprised By Haile's Retirement He was full of enthusiasm for London 2012 when they talked in September. Coe Calls Geb "The Greatest" "The greatest athlete of the last 50 years and arguably the best of all time." LRC Haile G's Retirement: Analysis Hearsay: Is He Really Done? We look at what led to Haile's retirement announcement, his prepartions for NYC and whether the Emperor could change his mind. Either way, just one week ago Haile was saying if you even talk about retiring in 3-4 years, you are done. Now he's saying he's done. LRC Haile G Shocks The World And Retires After Dropping Out Haile G stunned the running world with his announcement. Immediate recap, reaction, video and transcript. LRC Meb, Shalane, Gebremariam And Mary Wittenberg React To Haile's Retirement Gebremariam: "I think in Ethiopia he has to change his plans. He has to continue to race." While many are holding out hope this really isn't it for Geb, his fellow runners shared how important he was to them. Mary Wittenberg doesn't want him to be 100% done. Sports Illustrated: Gebrselassie Ends Storied Career In Stunning Style How about this writing!!! "Like Babe Ruth, who invented the homerun, Gebrselassie invented the modern distance world record." 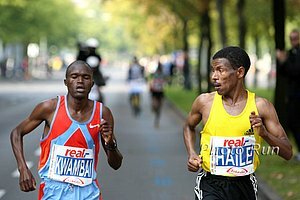 NY Times: At Mile 16, Gebrselassie Ends His Race, And Career The article is full of great info, including the fact that Gebremariam says Geb must change his mind. Charity/Amateur Roundup: LRC Edison Peña Steals Show The Chilean miner may have lost to Jared of Subway, but not in the hearts and minds of us or America. Plus, learn how Amani Toomer and Justin Gimelstob did. HS Action: Illinois: Craig Virgin Is Still The Best - But Barely Lukas Verzbicas misses his hallowed record by 3 seconds. Caster Semenya's Agent Says She's Far From Broke - Apparently She's Well Taken Care Of By Nike The last stories were all wrong.